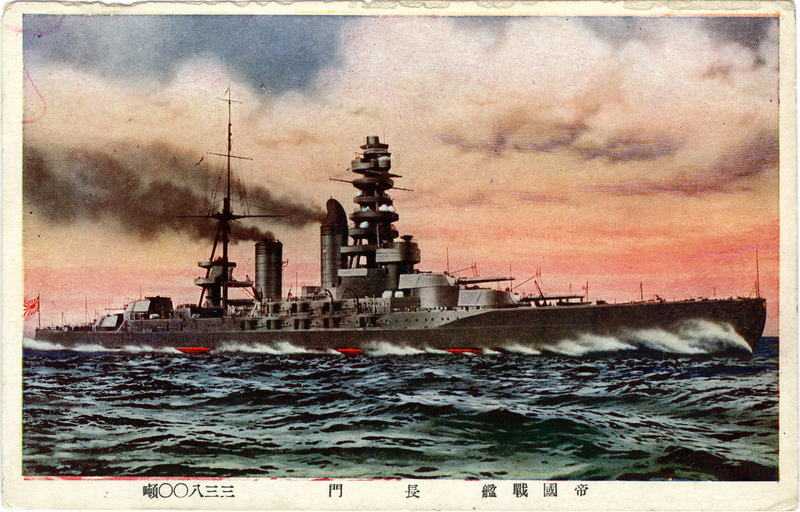 HIJMS Nagato, c. 1925, before the fore funnel was removed and a pagoda-style command mast added during reconstruction in the mid-1930s. Present at the September 2, 1945 surrender ceremony in Tokyo Bay, Nagato was the last surviving Japanese battleship of World War II. “Japan and the United States are both at work on large programmes of post-Jutland capital ships, and it is at these programmes we must look not at the respective fleets of older ships if we wish to form a true estimate of relative naval strength in the Pacific a few years hence. IJN battleship Nagato after reconstruction (single funnel behind the new pagoda-style command superstructure) & sister-battleship Mutsu, c. 1935, leading a review of naval firepower. 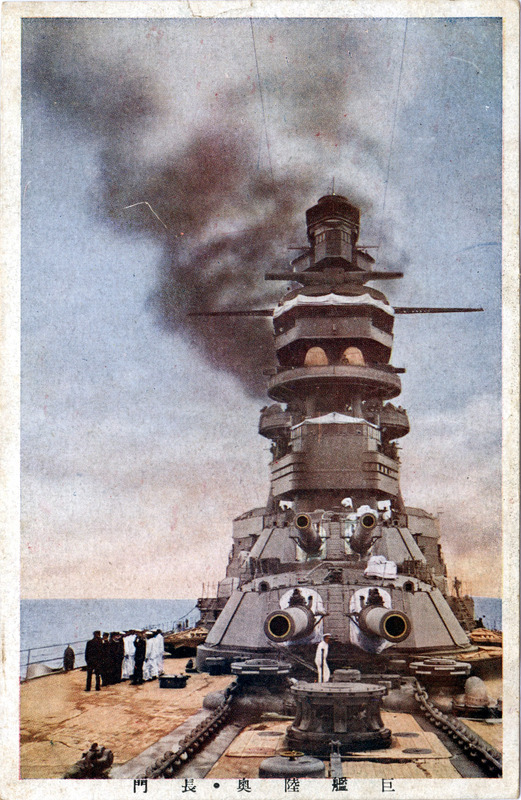 Forward turrets and original command superstructure, Battleship Nagato, c. 1930. From the wiki: “Nagato, named for Nagato Province, was a dreadnought battleship built for the Imperial Japanese Navy (IJN) during the 1910s. The lead ship of her class, Nagato was the first battleship to carry 16-inch guns and its 26-knot top speed exceeded that of even the fastest ocean liners, the Queen Mary and Queen Elizabeth. The battleship was modernized in 1934–36 with improvements to her armor and machinery, and a rebuilt superstructure in the pagoda mast style. 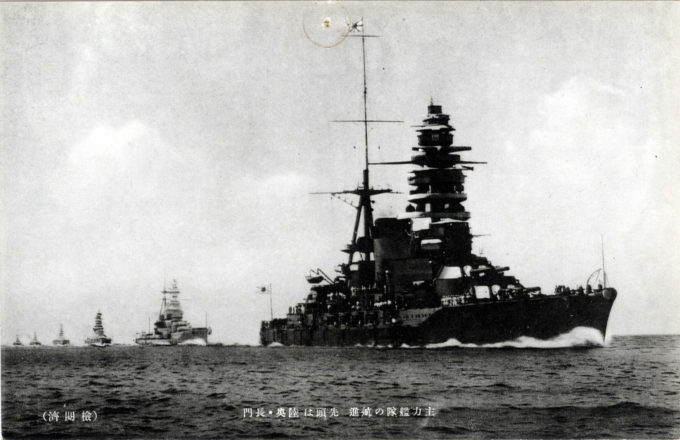 Nagato briefly participated in the Second Sino-Japanese War in 1937 and was the flagship of Admiral Isoroku Yamamoto during the attack on Pearl Harbor. “Other than participating in the Battle of Midway in June 1942, where she did not see combat, the ship spent most of the first two years of the Pacific War training in home waters. She was transferred to Truk in mid-1943, but did not see any combat until the Battle of the Philippine Sea in mid-1944 when she was attacked by American aircraft. Nagato did not fire her main armament against enemy vessels until the Battle of Leyte Gulf in October 1944. 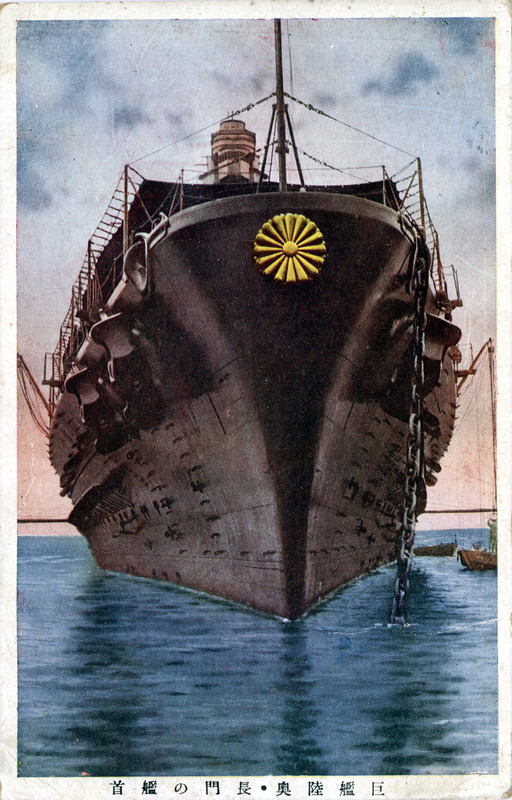 She was lightly damaged during the battle and returned to Japan the following month. Front view of the battleship Nagato, 1933, with the imperial “Chrysanthemum” crest (kikunogomon) affixed to the bow. “[By 1945,] the IJN was running out of fuel and it was decided not to fully repair Nagato. She was converted into a floating anti-aircraft platform and assigned to coastal defense duties. Nagato was attacked while anchored at Yokosuka Naval Base in July 1945 as part of the American campaign to destroy the IJN’s last remaining capital ships, but was only slightly damaged. Present at the September 2, 1945 surrender ceremony in Tokyo Bay, Nagato was the last surviving Japanese battleship of World War II.